Recently, Penguin Pete, who’s on my blogroll, wrote this piece about his disapproval about where Ubuntu was taking Linux. Some of his key arguments were….doh! He removed the posts. I guess I’ll have to summarize. He said, in a nutshell, that too many Windows users were going to Ubuntu and expecting it to be just like Windows. But Linux is not Windows. This is not to say that there’s anything wrong with people going from Windows to Linux, but their demands to rearrange Linux, which was made in the image of Unix, to be more like Windows, raelly rubs some people the wrong way. He suggested that if users wanted a FOSS version of Windows, they should go to ReactOS, a Windows clone. Originally, I was going to post about how I was on the fence about this, but somewhat in favor of Penguin Pete’s point of view. Afterall, I really like Linux a lot for what it is. It served me very well as a web server for a few years and I love the command line. I like the Unix philosophy of small programs that do things well and I like a lot of the software. It’s also easy to learn about your computer and change things in the command line. I don’t want to see all that go away just so we can accomodate lazy users. I’d rather see them stay away from Linux if they are that averse to Linux. So, to me GUIs are OK, but don’t remove the ability to edit the text files! In Fedora, for example, there are some text files that can easily get overridden just because you choose to use the GUI. I think we need to do our best in Linux to cater to both types of users. 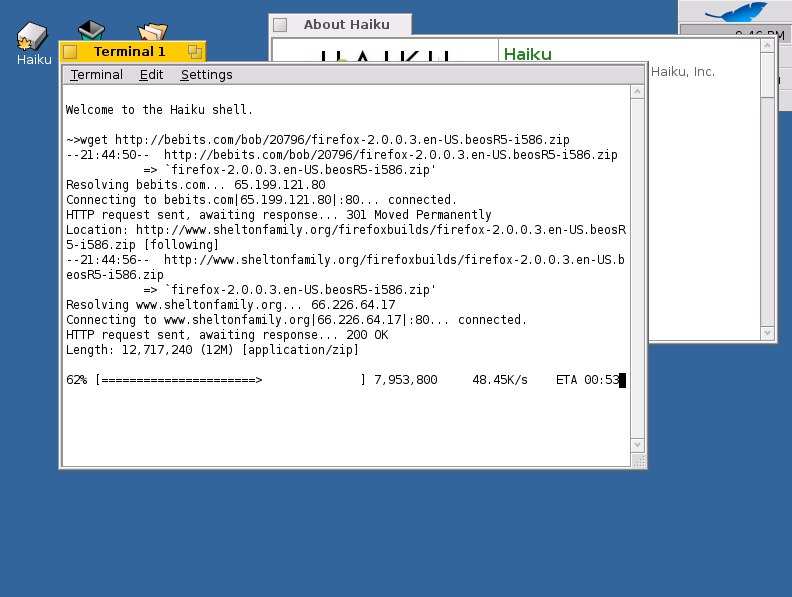 Keep the command line stuff for those who were attracted to Linux because of the ability to tinker, absent in Windows. Keep GUIs for new users, lazy users, or for those days when even the command line junkies just want to rest their minds and configure some utility without having to read miles and miles of manuals. 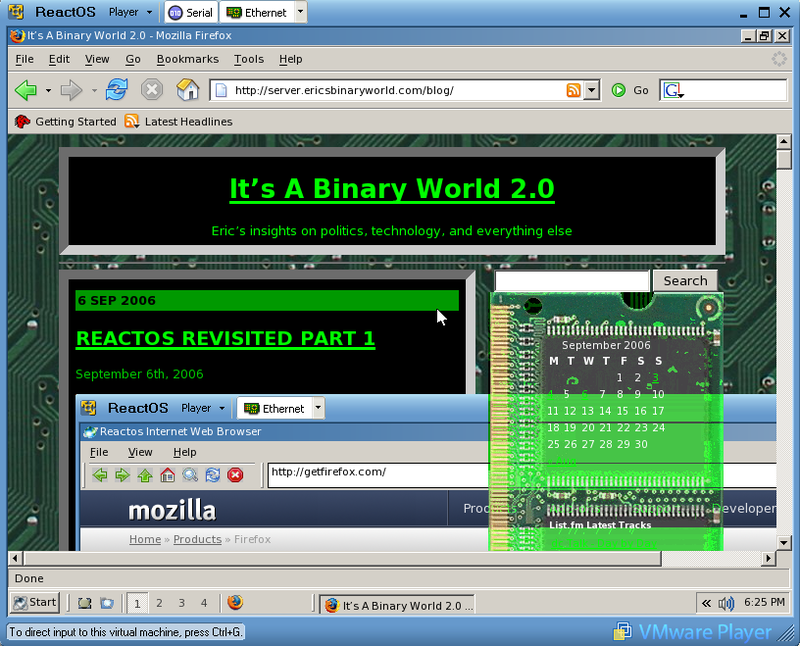 However, for those users who want to have Windows, they should go to ReactOS. It’s not ready for primetime yet; in fact, they recommend only running it in VMWare or QEMU for now, but Beta shoudl be coming soon and should be good enough for a good 70-90% of the people. And if people good at programming who love Windows go over to ReactOS, it could probably reach its goals even faster! Trbovich has a great writing style and the logic of his argument does appear consistent. It is also unashamedly elitist. Acording to Penguin Pete, Ubuntu is not really Linux but a cultural cringe to refugees from Windows. Paraphrasing his words, Ubuntu is a Linux distro that is trying to stretch itself like taffy to fit Windows users. According to Penguin Pete and an apparently not inconsiderable band of Linux stalwarts, Linux is not and never will be an operating system designed to suit disillusioned Windows users. They reckon Linux was designed to be a replacement for Unix not Windows. Some dissatisfied Windows users may argue that they don’t want to replace Windows with another version of Windows – open source or not – anyway. So for Windows users determined to leave the fold, there’s really only two viable choices – Macintosh or a Linux distro. For those not interested in being enclosed in the walled garden of the Mac, Ubuntu has become the Linux distro of choice for a large number of Windows refugees. I don’t want to put words into Stan Beer’s mouth, but I think he misunderstood Pete. The types of users Stan describes there are not the ones that Pete was angry about. He was angry about the ones that come to Ubuntu and complain about each and every little thing that isn’t exactly like Windows. I have been an IT professional for over 25 years. I have been in my time developer, sysadmin (many OS’s), db admin, hardware support, cable puller and all the rest. I have no issues with doing any of that stuff, it’s just that it’s not what I do now. When I’m doing what I do now, I’d like computers to just work. And for that matter, when I’m not working, and I want to play some music, I don’t want to have to google the latest encoding schemes and determine which codec I need to update. I want it to just work. Therein lies a hurdle which Open Source has negotiated poorly to date – one of product management and marketing. And the reason that that hurdle remains is largely in the makeup of the FOSS community. So, as I propose in the reply to that blog post, I think this is why my (and many others’) fervor for open standards is SO important! When we have free and open standards such as OpenDocument, PNG, OGG, etc we allow people to use any operating system they want. Originally when I created pictures in the the bad old days in MS Paint on Windows 3.11, a Macintosh user could not read it. More recently, when I created MS Word doc files, they could not be read by anyone that did not have MS Word and that means just Windows and Macs as long as MS continues to support office on Mac. Linux users, however, cannot read those files. (Nowadays with OpenOffice.org they are close, but not exact) Imagine the internet if JPEGs or GIFs could only be read by Windows or Macs. It would be horrible! So my view of the future is one where I see open file formats and FOSS in general alllowing for a fragmentation of the operating system market. And, because of this openness it won’t be like the 80s when Amigas weren’t interoperable with Commodores or DOS. And in this future, the stuff that Penguin Pete, Stan Beer, and Confused will become a relic of the 90s/2000s because people will use whichever operating system meets their needs without having to worry about compatibility between files. People won’t have to use MS Office because they’ll need doc to communicate! We’ll have odt and so they will only use MS Office if MS can provide enough value to convince people to buy their software. When the files produced are just as good in OpenOffice.org as Word, they will need to work extra hard to make their product worth $300. Why do you think they are so opposed to OpenDocument? It’s not for technical reasons, as they claim, but because it threatens their monopoly. After all, if the files were the same, why not use something FREE instead of $300??? So in my future people use whichever operating system meets their needs best. If they are running a server they will choose Linux or BSD. If they want a desktop where they can tinker with every little setting they will choose Linux or BSD. If they want a desktop that will make all the decisions for them and leave them with an elegant and easy to use computer they will choose Windows, ReactOS, or Syllable. 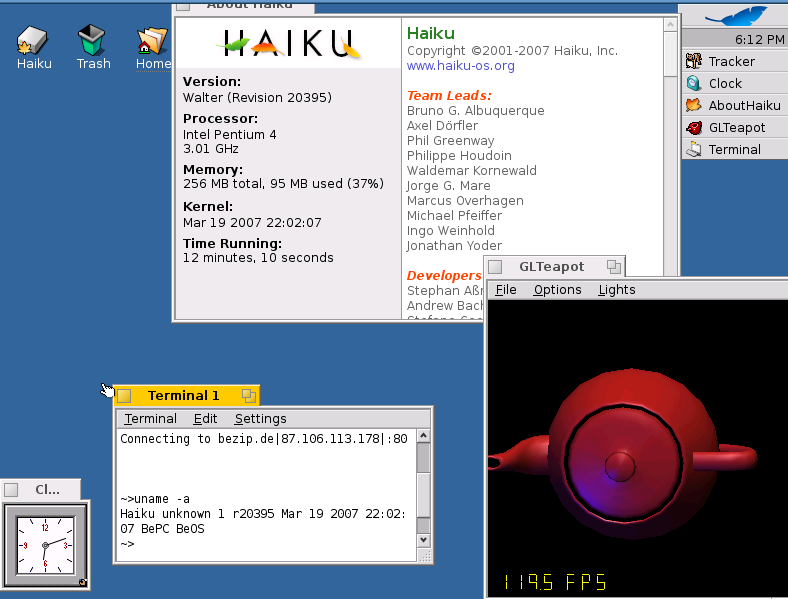 If they want a computer which perfect for video editing and so efficiently written that one user claimed he used to play Quake and watch tv on the computer at the same time, they will choose Haiku-OS. Haiku with the 3D teapot! You say, “He said, in a nutshell, that too many Windows users were going to Ubuntu and expecting it to be just like Windows.”, and that’s exactly why I took it down. No where did I say that I *disapproved* of it, I made it clear that I was perfectly OK with it, as long as we designate one distro (or two, or three) that we all can agree on to be the “official substitute Windows”. It was my fault for just not making that clear enough. Some ideas just don’t want to be dragged into the daylight, I guess. In this older post I made that point more clearly: “That’s also why systems like ReactOS and Xandros and Ubuntu make so much sense, now. Those are ‘half-way houses’ to which we send Windows ex-cons so that they can be rehabilitated into society again.” That seemed to be better received. For some reason. Now, I’m thinking time has passed and too many ex-Windows users don’t want to leave their half-way houses – they seem to just want to build a new comfortable place that’s just like where they left. Well, why not? We Linux-because-its-Linux fans have our free Unix, do we not? And I’m not judging people for that! It is *not* *their* *fault* for using Windows, they were *forced* to use it… heck, *I’ve* been forced to use it in the past. After all, it is a convicted monopoly. And some people can’t help being mentally lazy – again, this stinking culture is to brains what Raid is to roaches (and it seems to see them with equal contempt!) – what are they going to do if they’ve never been mentally stimulated in their entire lives? As for ReactOS, I’m trying to goad Windows users to it because there’s all those Windows programmers and all that demand going to waste: ReactOS is dead in the water, because its intended user base has given up on it. I’m hoping it will be mature one day; that’d solve everybody’s problems on this issue. Linux was once an alpha system, was it not? So here we are: how do we get a non-builder culture to build themselves a new home? Really, I just want to drop the issue now and move on. This idea is obviously too confusing for a lot of people. Maybe a year from now I’ll pick it up and look at it again. Maybe SJVN will have the same idea and blab about it and then everybody will like it better coming from him. But thank you for your insight! Maybe YOU are the right person to carry the plan through! If you want, I’ll SHIP the two “Ubuntu is not Linux” posts to you, and YOU can babysit them! But I hope you see (and from your second comment, it appears to be so) that I meant it as a point of agreement vs yet another voice of contention. Yeah, I do. You nailed quite a bit. What wilts my blossom is that there is *NO* solution. Windows people, unlike the users of every other platform, just don’t seem able to build themselves their own house like the rest of us do. Seriously, a free DOS running a free window manager with MS compatibility wouldn’t be that bad a thing to have in the world, provided it was open source and we could fix its problems.